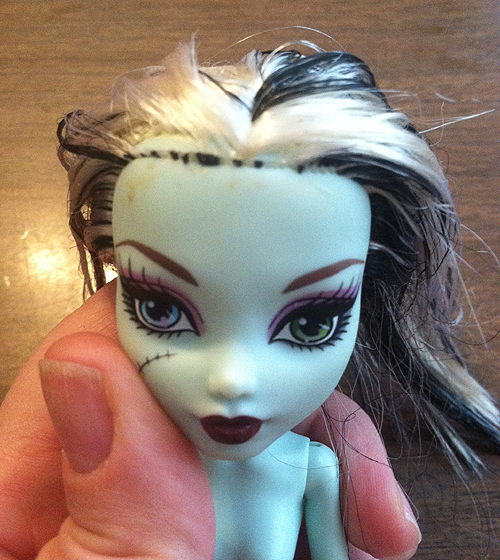 Recently I acquired an original Frankie Stein doll with a bad hair cut that I felt was worth fixing. Someone happily chopped off the front of her hairline and I finished the job by trimming it all the way down to the scalp and then pushing the rest back through the root holes with a straight pin, effectively giving her a new hairline! After washing her up and combing the rest of her hair I decided she needed a perm. I wanted some nice crimped waves and settled on seeing what braiding would produce. I wrapped the ends of the braids with pipe cleaners instead of elastics because most elastics will melt right into the hair in boiling water. I had previously only boil-permed a Journey Girl’s hair and had good results so I used the same method. Just boiled a pot of water and dunked her whole head in for a 10 count twice. The braids came out nice, soft and relaxed, just as I suspected. After 24 hours I removed the pipe cleaners and picked the braids out. Turned out pretty rad, exactly like I hoped! Just as a test I washed her hair again and combed it out, the waves stayed perfect! Previous PreFitted Tutorial Lux Edition! Update! I never thought of pipe cleaners. Great idea! Thanks for sharing. 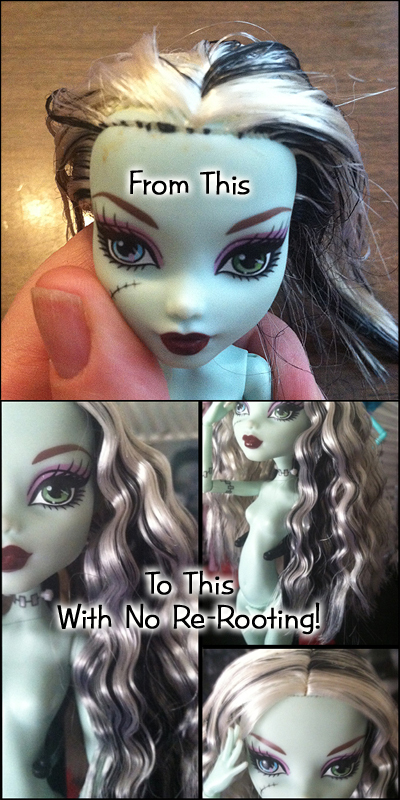 I have done this technique with several Barbies. Hi I hope you can help me with a few Barbie’s I recently bought. They both have extremely greay hair. Do you think this process will help. I’ve washed it already with Dawn dish soap but it didn’t help. Do you have ant ideas? 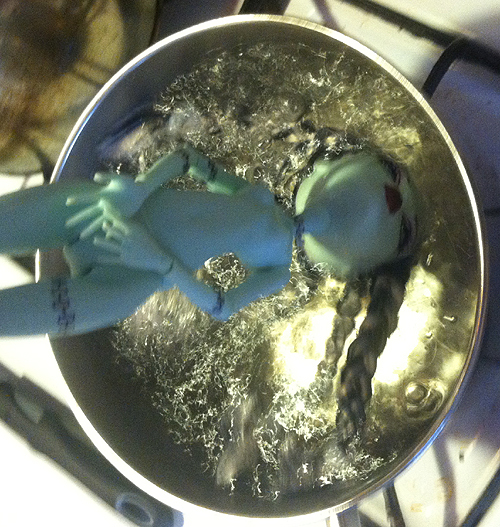 Washing and rinsing the whole doll with boiling water CAN remove stains and refresh the doll. However, if the hair is really dirty I would continue washing it in cold water until it comes as clean as you want it before putting it in the boiling water. You can try other dish soaps, laundry detergents hand soaps and even shampoo until you find one that has the best effect. White vinegar is a very good, safe rinsing agent also. I have found that washing anything in hot or boiling water prior to removing stains or smells tends to set them in. Hope that helps!